90% OFF All New Halloween Merchandise! 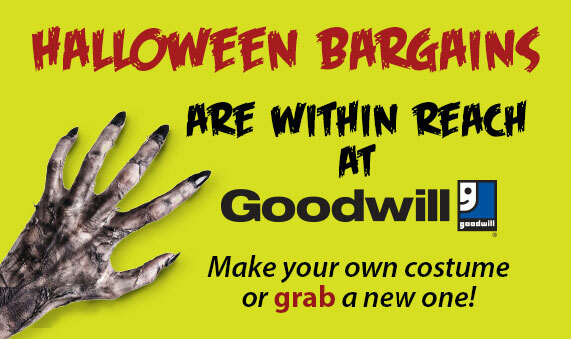 At Goodwill you can mix new and nearly new items to create costumes that SCREAM creativity! Plus you’ll find “grab and go” NEW costumes for adults and kids along with brand NEW hats, wigs, masks, make-up and props! blog, make-up tutorial videos and more. Browse through our book of costume ideas for women, men, kids and couples Here! Take a peek at what's in store! We have frequent promotions and discounts. ​Get notified about our next promotion. Be one of the first to know about our next promotion.